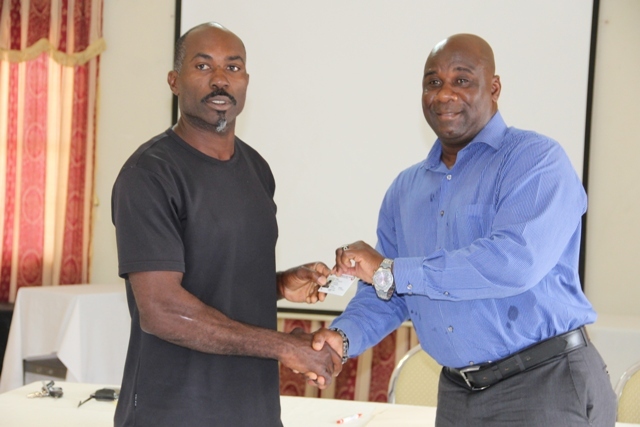 NIA CHARLESTOWN NEVIS (MAY 26, 2016) – The Department of Agriculture issued Farmers Identification Cards to select farmers on Nevis during a ceremony to launch the new initiative. It was held at the Red Cross conference room on May 24, 2016. Card holders will be afforded greater benefits from the Department and the private sector. The ceremony formed part of the Department’s Agriculture Awareness Month celebrated in May. This year’s theme is “Adapting to climate change to achieve greater food security”. In his remarks at the launch, Permanent Secretary in the Ministry of Agriculture Eric Evelyn, who chaired the event, explained that the identification card is one of several initiatives undertaken by the Ministry and the Department of Agriculture to revolutionize agriculture in Nevis. “We want to raise the profile of the industry. 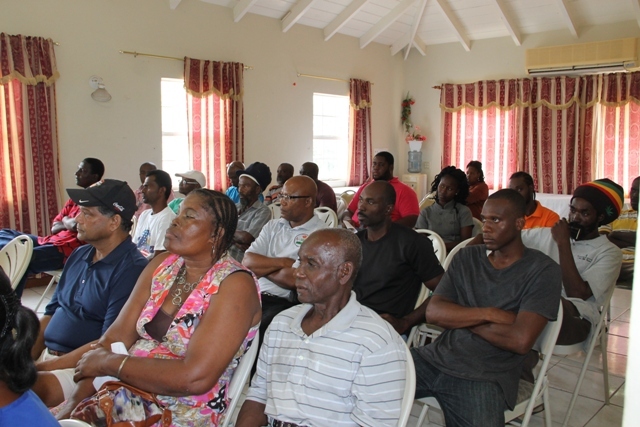 We also want to raise the profile of the farmers…We are trying our utmost to have a database of farmers on Nevis. “We want to have all of the farmers registered. 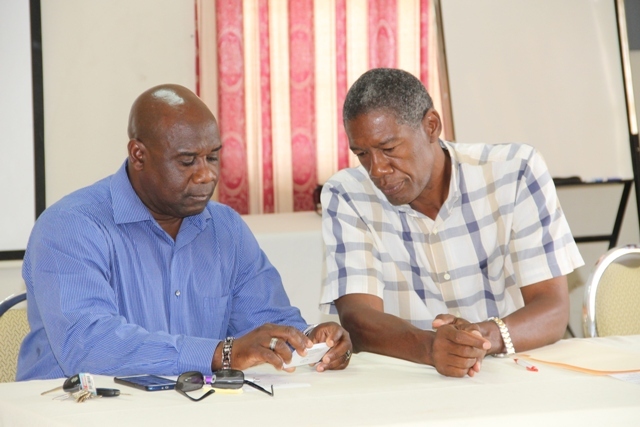 We are hoping that with farmers being registered, it would tell the outlets, in particular in Nevis, that our farmers…who have identification cards…are authentic farmers and are farmers that they need to do business with,” he said. In order to qualify for the card, farmers are required to satisfy at least six conditions set by the Department. Their yield of agricultural crops produced or quality of livestock raised in the farming operations is one consideration. Also their use of irrigation, pesticides, fertilizer, mulching, animal feed, the veterinary services, animal housing, marketing and extension services and pasture production in the farming operations. Their adaptation of practices and technologies as advised by the Department, record keeping of farming operations, active membership in a farming organization of the owner or tenant engaged in the farming operations will also be considered. Also, their application for duty free concessions with respect to the farming operations under any agricultural incentive policy of the Nevis Island Administration, conducting the farming operations as a business, and obtaining over 65 percent of their total income from the farming operations are also part of the criteria. Meantime, Director of Agriculture Kiethley Amory in remarks, outlined the importance of offering the cards to the local farmers and explained the benefits of being card holder. “The Farmers Identification Card is very important…it proves that…you are a genuine farmer… you are able to go to T.D.C and get some concessions. “I have been in contact with other agencies…we are hoping that they come on stream giving concessions to ID card holders,” he said. The Director of Agriculture noted, that for the time being, the primary focus is on farmers who practise commercial farming but they are encouraging subsistence farmers to move into commercial agriculture. 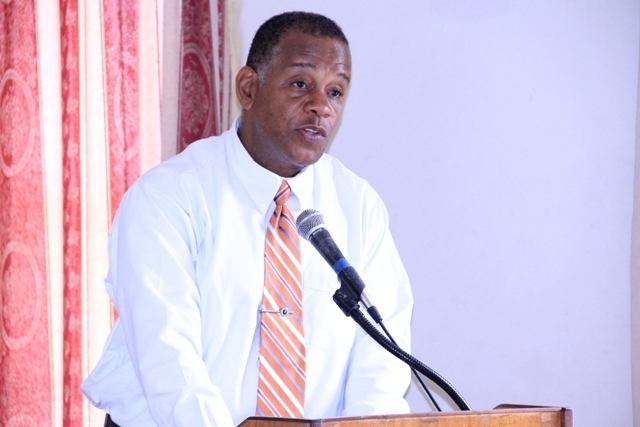 Amory, also said, in recent times the Department has seen an increase in the importation of food and is seeking to ensure food security on Nevis. Minister of Agriculture Hon. Alexis Jeffers thanked the farmers for their contribution to the ministry. He told them that the identification card initiative was an investment in them. The Agriculture Minister expressed hope, that the initiative would be embraced by all farmers. He also gave the assurance that the NIA would continue to provide opportunities for farmers to ensure that they can continue to contribute to the island’s food security.